Five exotic crocodiles that lived alongside the dinosaurs 100 million years ago, including one sporting boar-like tusks and another with a duckbill snout, have been discovered in the Sahara. Unlike their modern cousins, the ancient crocodilians were as agile on land as they were in the water. They were reptiles like the dinosaurs, but belonged to a completely separate lineage that continues to this day. The crocodiles once ran and swam across present-day Niger and Morocco, when the region was covered by lush plains and broad rivers. Scientists found the newly-identified fossils at a number of sites in the Sahara desert. Many were uncovered at one location, lying on the surface of a remote and windswept stretch of rock and dunes. 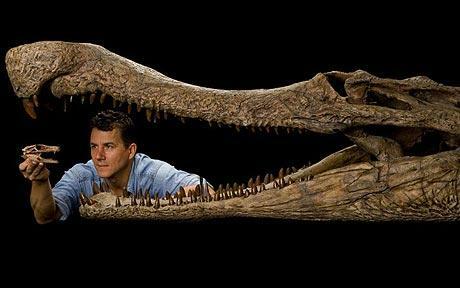 Expedition leader Professor Paul Sereno, from the University of Chicago, has previously described the largest find, Sarcosuchus imperator, which measured 40 feet and weighed eight tons. Popularly known as ”SuperCroc”, the giant carnivore was the biggest but not the strangest of the extinct creatures. They were given nicknames by the scientists, based on their unusual physical features. ”BoarCroc” (Kaprosuchus saharicus): A 20 feet upright meat-eater with an armoured snout and three sets of dagger-shaped fangs. ”RatCroc” (Araripesuchus rattoides): Discovered in Morocco, this was a three-foot-long upright plant and grub-eater. It had a pair of lower jaw buckteeth which were used to dig for food. ”PancakeCroc” (Laganosuchus thaumastos): This animal’s fossils were found in Niger and Morocco. It was a 20-foot-long squat fish-eater with a three-foot-long pancake-flat head and spiky teeth on slender jaws. ”DuckCroc” (Anatosuchus minor): A three-foot upright species that ate fish, frogs and grubs. It had a broad, overhanging snout and a long nose. Sensory areas on the snout helped it root around shallow waters for prey. ”DogCroc” (Araripesuchus wegeneri): Fossils found in Niger included five skeletons next to each other on a single block of rock. DogCroc was a three-foot-long upright plant and grub eater with a soft, doglike forward-pointing nose. Describing the finds in National Geographic Magazine, Prof Sereno wrote: ”My African crocs appeared to have had both upright, agile legs for bounding overland and a versatile tail for paddling in water. Colleague Dr Hans Larsson, from McGill University in Montreal, Canada, who discovered the bones of BoarCroc and PancakeCroc, said: ”We were surprised to find so many species from the same time in the same place. The scientists studied the animals’ brains by creating digital and physical casts from CT-scans, 3D X-rays. Both DogCroc and DuckCroc had broad, spade-shaped forebrains that looked different from those of living crocodiles. ”They may have had slightly more sophisticated brain function than living crocs, because active hunting on land usually requires more brain power than merely waiting for prey to show up,” said Dr Larsson. A paper on the finds is to appear in the journal ZooKeys. The creatures will also star in a documentary, ”When Crocs Ate Dinosaurs”, to be shown on the National Geographic Channel.